No matter how well you plan your fishing outings, you are never exactly sure what you might run into. As I pack my fishing vest, I try to include all the tackle I might need, and sometimes will put in a few undersized and oversized hooks and leaders. I get funny looks from my fishing buddies, but one never knows what opportunities might present themselves. I was reminded of some of my surprise opportunities when my buddy Tom and I were out fishing for little cutthroat trout in one of our local streams. These are tiny little fish, most under eight inches, but provide excellent practice for fly-casting. Here on the Oregon coast, not much will rise for a fly, but cutthroat are legendary for their aggressive rises to grab a floating surface fly. Wading though the streamside jungle (no rain shortage on our coastal range! ), I was casting my little four-weight Loomis out into the pocket water below. This was looking like a real red-letter day. My renegade fly was attracting lots of attention. Everywhere I cast I was seeing calm waters erupt as the pretty little trout fought over my offering. I switched to a little caddis, and then an Adams, and had fish on everything I floated down to the water. Then I cast my line over to a little drift on the far side of the steam. I saw my fly go under, and a tiny splash of water dimpled the surface. Drawing my line tight, I could feel just a little vibration of a very small trout. As I brought it toward me, I could see a shape coming to the surface. The water bulged a bit as it came up. Something didn’t compute—the shape I saw was a lot bigger than the pull I felt. As it got closer, I could see that the fish in view, was above where my line was leading. This was a chaser fish, not the one on the line. Now that’s pretty common. A lot of time fish will follow each other, maybe out of habit, maybe curiosity, who knows what a fish thinks? This one, however, had something else in mind. As I reached down to free the little fingerling on my line, it flopped loose, pretty common since I use a barbless little hook. But the result this time was anything but freedom. As it hit the surface, the bigger trout opened its mouth and gobbled it down! This shocked me a bit. I knew these fish readily hit flies and streamers, but I hadn’t heard Tom mention cannibalism! Well I’d sure share this fish story with him when we got together to hike back up to the truck. I cast to another pool, hooked another little trout, and brought it back in. Pulling it out of the water a few inches, I took off the hook and put it back in. Whack! Something brushed my fingers as it shot after the little fish. Instinctively I pulled back my hand. What was that? On the next fish, I got a good explanation. As I pulled yet another little “cut” toward the bank, I caught a glimpse of something finning out from the rock I was standing on. That bigger cutthroat was hiding there waiting for another meal! As the fish got closer, he darted out, pulled it off my hook and swam back under the rock. That 10-inch trout had this down to a science! I found myself wondering if he did this every time he ran into a fisherman? I tried running a few flies and streamers down near his hiding place under the lip of the rock, but nothing seemed to interest him except live bait! I remembered an excerpt from a fishing book I had enjoyed years before. One of the fancy fishing clubs back East had a strict, “flies only” policy. They had several nice pools on the steam, one of which was full of huge trout. The big boys would ignore most everything cast to them (probably why they got big! ), and were driving the author crazy. One day he’d had enough, hooked a little trout in a pool nearly a hundred yards away, and walked it all the way down to the big pool, where one of the resident giants gobbled it down! One of the members saw him committing this blasphemy and he was asked to leave, but he said it was well worth the banishment! Big fish eating little fish is no big surprise. Most bait fishing is done with whole or chunked-out anchovy, herring or other smaller fish. But having something eat the fish you are bringing in as your primary catch is always a bit disconcerting. On my first rock fishing trip out of San Francisco, I remember one of the deck hands telling me to wait a few minutes before I brought in a little rock bass I had hooked. I thought he was just asking me to wait a minute or so to give him time to land fish other anglers were bringing up. When my rod doubled over and darn near pulled me out of the boat, I realized that something pretty exciting had happened. It took nearly half an hour, but I finally hauled in a 30-pound lingcod. When we pulled out the hook, we found a three-pound red rock cod still had much of my hook in its mouth! Surprise! About five years ago, I was pulling in a little rainbow trout that had been planted in Coffinbury Lake at Fort Stevens State Park. As the trout got near the dock, a huge brown shape swam out and took a swipe at it. The trout darted away and the shape swam back under the dock. 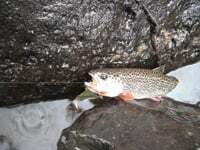 I put on a bigger hook, caught another trout, and guided it toward the spot on the dock where the shape had retreated. As it got near, the brown fish charged out and swallowed the 10-inch trout. The hook had been big enough to stick out of the trout’s mouth and snared a nice four-pound bass! I had a much fuller stringer than I had anticipated! I always listen to my guides so I have a few shad packed up in the freezer and will haul them up north in a couple of weeks. I hope the big flatties are as aggressive as that cutthroat I ran into the other day!